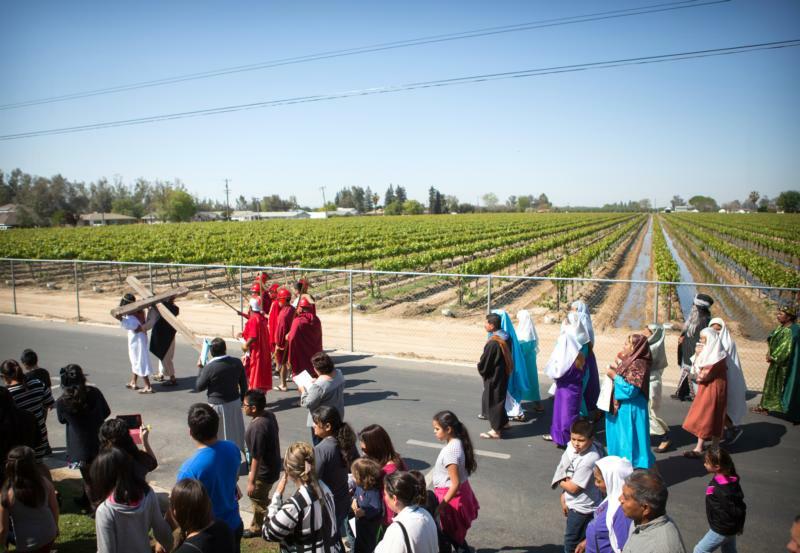 KINGSBURG, Calif. (CNS) — Every year on Good Friday, Catholic communities throughout the world re-enact the Way of the Cross with live performances of the story of Christ’s final journey of his earthly life as a powerful reminder of his suffering and sacrifice. This traditional Catholic Lenten devotion is based on the 14 significant events of the Crucifixion — beginning with Christ’s sentencing, continuing with his carrying the cross through Jerusalem and ending with his burial. In the Diocese of Fresno, several parishes stage their own versions of living Stations of the Cross with colorful costumes, long processions and large crowds of pilgrims and onlookers. The tradition is strong in two towns, Kingsburg and Easton, both of which have significant migrant populations. Last year, the procession in Easton had more than 400 participants, many of whom were day laborers who had to sacrifice their daily wages to attend. Alberto Varela, who played the role of Jesus, has participated in the event three times. “The procession brings us all together, helps us become a solid community and builds our faith,” he told Catholic Extension magazine. In Kingsburg, many of the performers and participants are migrant workers. The town is the headquarters of Sun-Maid, the largest raisin and dried-fruit processor in the world. The Hispanic ministry coordinator for the Diocese of Fresno, Brenda Noriega, whose salary is funded through Catholic Extension’s Hispanic Lay Leadership Initiative, works with parishes throughout the diocese, including Kingsburg and Easton, to strengthen migrants’ connection to the Catholic Church. Her office also supports the Good Friday processions. “This procession is part of our Hispanic traditions,” she said. “When the Spaniards evangelized, they used symbols. They made Catholicism very tangible. She believes that the procession is a tool to share Christian values, particularly with younger generations. They get to see Christ’s story in real life.